I got into tea in 2012. One of the first things I did was read everything I could in the western tea scene. This included old forum posts, new forum posts, blogs like Marshaln, Half-Dipper and the Chadao Blogspot. One constant I found was the constant bemoaning the ever-rising price of pu’erh, as long as there’s been dialogue about it on the internet. It didn’t matter if the post was written in 2008 or 2012… Since 2012, the situation hasn’t exactly improved. The most dramatic rises have been in maocha and current year productions. The majority of the highest-priced tea being peddled from popular online sources definitely isn’t old vintage tea, it’s something made in 2018 (OK, maybe 2017)!! Notably not everything has gone up equally. Things like YQH Qizhong, while never cheap in the first place have been fairly stable in price even since my initial foray into pu’erh. For the value-minded, this has made some of these semi-aged teas the target for people like myself. Important Concept: Pu’erh Maocha Prices have Gone Up A LOT! While you can occasionally find people who think buying young tea is a cost-saving maneuver, people generally acknowledge that the price for raw material has gone up a lot. It’s difficult to put an exact number on this, but when I looked at western vendor prices between 2011, the number went up by anywhere from 175-335% for the median production. The median tea from a western vendor would cost ~$40/357g in 2011. If you’re familiar with modern pricing, that sounds awfully cheap. The data backs this up and in 2017/2018 the average production would be $110 to $175 per 357g depending on how you do the math.. The gets trickier as this theoretical 2011 median tea in all likelihood costs more than $40 now. Yunnan Sourcing is a vendor where prices are raised steadily (15-20% annually). In a past article I took two average priced 2011 YS Productions and looked at their prices six years later. The teas rose by 115% and 148% a significant amount, but it’s also less than 175-335%! 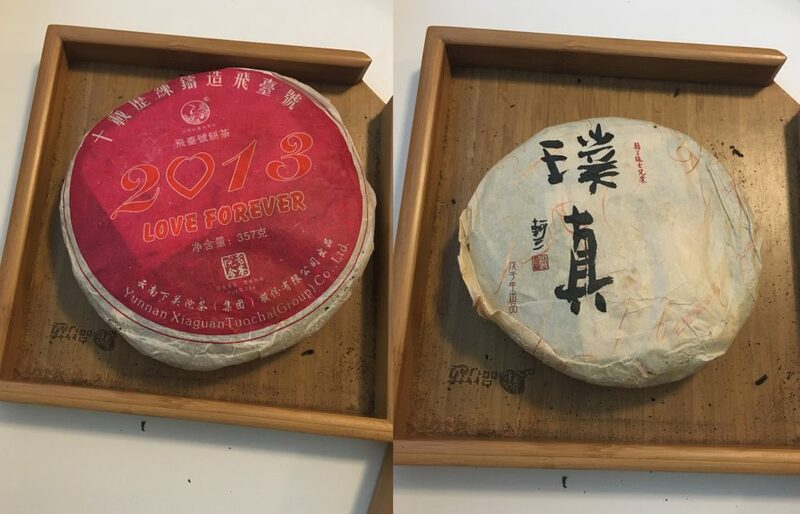 Even with Yunnan Sourcing’s steady price increases, you could find a pretty convincing rationale why buying these older teas are a better deal than 2018 median tea.. Sure some of the same 2011 production now sell for 2-3x the price but if maocha prices have risen even faster, the older productions gain back appeal. The data on pu’erh prices on release by western vendors backs this up. If we look at the % price rise per year, it is telling. The prices for the median production have risen by 27.27%, 28.57%, 44.44%, -19.23%, 28.57%, and 11.11% from 2011 to 2017. Under this premise, the median production produced by vendors tracked has risen by ~172% in six years. Or if the median/replacement level tea in 2011 was $35.70/357g, the 2017-pressed equivalent would be $97.35. Pretty steep. Generally, when I’m shopping I’m not targeting the best, nonpareil leaves, but am looking for something that is good, interesting, with a price that doesn’t make me choke on food. There are other sorts of shoppers, but I suspect this describes a large chunk of tea drinkers reading this. You can find more extreme price raises than YS automatic 15-20%. 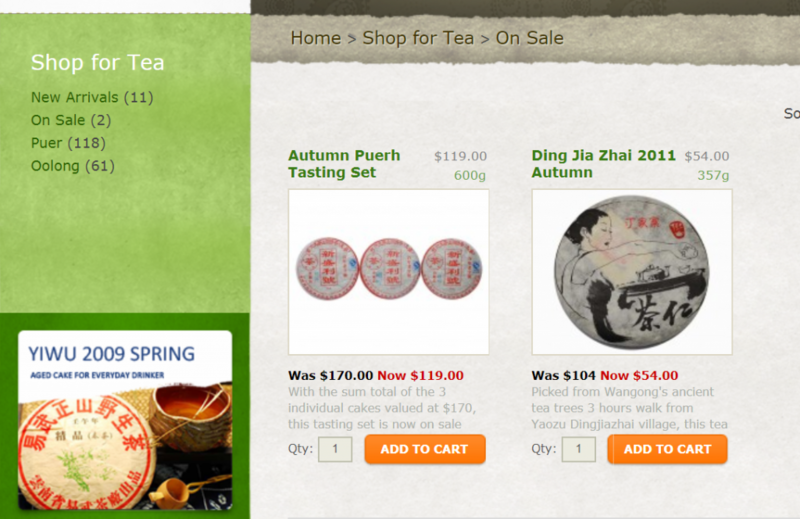 You can also find teas that have not risen in price hardly at all. Certain teas have gone up 10-20x in price six or seven years. As consumers we’re not married to a single tea and can pick and choose. In other words we don’t have to buy an average/replacement level 2012 tea. Let’s take a vendor like Tea Urchin as an example. Tea Urchin was was more active in the public eye when they first started pressing in 2011. They still sell new productions now and then, but they’re not as active as other vendors like Yunnan Sourcing or White2Tea. I believe they also have other income to support them, so they don’t have to try as hard to sell tea and turn over their inventory every year. Yes, they’ve raised many of their prices and some productions have sold out, but other teas have stayed close to the original price, making them potentially good value targets. This is made even more striking because Tea Urchin’s very reasonable prices were considered very high at the time of production. If we look at my analysis from two weeks ago on 2018 prices, we can see that in terms of their relation to the average priced tea of a specific year, TU sells more expensive tea than W2T. But TU sold more tea a few years ago and W2T is currently more active. These few years make a big difference in the absolute pricing. A couple questions to consider: How does this price compare to when it was originally offered? If it is somewhat close, then the tea might represent a good deal. What do you think that production would cost if made today? This same thinking doesn’t have to apply to just western vendor produced tea, but can be applied to any production that was acquired a while back. You could make a case for Hou de Asian, another vendor with an independent source of income apart from tea. They offered teas sourced from trips to Taiwan and were most active during the mid to late 2000s. Hou de bought their tea a long time ago. When they tppl more tea out of their storage to restock their site, they’d often be underpriced compared with something freshly sourced from Taiwan. As time went by, the difference in price increased for many of their teas, because the tea prices have slowly risen in Taiwan, while Hou de’s have been on a more mild upward trajectory. On one hand this vendor behavior seems lazy and just a bad business practice.. But it’s also easy to understand if we look at it from a vendor’s perspective. The point was never to run a charity operation but to sell the tea for profit, something that is still being accomplished albeit at a lower price. One available example I can point to is the Xiaguan Love Forever Paper Tong. This tea purportedly uses 2003 material but was pressed in 2013. The initial price of the tea (in 2013) isn’t much different from the price being offered now (TWL sells it with a small markup for $120/357g, $0.33/g). In my opinion, there is nothing terribly off or wrong with the tea. It’s a solid tea with cheesy marketing that doesn’t seem to have huge demand. A couple semi-aged cakes I’ve bought in the last few years. So.. Why Hasn’t The Tea Risen in Price? If you’re after something super hip, deliberately shopping for old prices isn’t ideal. There’s also a good reason to be skeptical of tea that hasn’t risen in price. Maybe it was not processed well or is aging poorly or is just boring. It’s also possible that the tea is just fine. You need to make sure the demand for the tea isn’t low for the wrong reasons.. Maybe the tea is out of fashion or it just never took off. It’s important to have some plausible answer to this question. You don’t want to end up a tong of a tea that was processed poorly and won’t be good now or ever. In general, this rationale isn’t always ideal for shopping for uber tea either, say scarce region and/or vintage teas. Premium productions are subject to somewhat different market dynamics and are moved more dramatically due to their relative scarcity. Maocha/current year prices have risen a great deal. Older teas have also risen. Some have risen by a great deal. Everything has gotten more expensive, but select older teas have gotten expensive less quickly. The deals are in finding these teas from 5-12 years ago that have risen in price less quickly compared with current market trends. This entry was posted in Article, Raw Pu'erh and tagged Tea Urchin, YangQing Hao, Yunnan Sourcing. Bookmark the permalink. 8 Responses to Shop Like It’s 2012. One Way to Think About and Find Value. Out of curiosity, do you have any impressions of how prices have fared inside of China? I wonder how much of the price effect we’ve seen has been specific to Western vendors versus the (much) greater market. It probably depends where you’re talking about. I’d expect access to be a lot better.. The modern stuff should be subject to similar pricing though. Have been singing Tea Urchin’s praises since placing a few orders this summer. There is some well priced stuff in there for sure for those who have the time and energy to dig deeper. I do agree the west in general has a pretty big access issue with getting semi-aged teas.. But I guess I’d push back against the notion that it’s like finding a needle in the haystack. Sure, finding good or great teas that you’ll love is hard. But isn’t that always the case? I’m also not arguing about finding super cheap prices for great tea. Replacement level young sheng, really isn’t that cheap (median: $0.30/g ~$107/357g). I think if you want to beat that metric in value (very subjective, I know), it’s really not very difficult at all, even considering the access issues of the western market. Hahaha… Ok that’s a bit of an exaggeration on my part. I agree with what you are saying in general terms but am simply speaking to the very specific situation of finding a great puerh at a cheaper price with a vendor such as Tea Urchin that has lots of stock from years ago- it’s harder as time goes by and stock sells out. If you are looking for good drinkers of value, Tea Urchin has lots of this as I have stated in last years posts. That’s fair enough. You’ve been drinking tea and writing about it for a long time now, so I can definitely imagine it being quite hard to find more extraordinary and special teas. I feel increasingly similar depending on when you ask me. As far as Tea Urchin goes a lot of the under $100 / 357g cake stuff that was real good has sold out, also some of the real pricey top tier stuff that was real good like their LBZ and Miles Blend, and that GFZ sold out too. The middle stuff is where the bargain is at Tea Urchin and I think it’s because there isn’t as much of a market for this. There is a bimodal thing going on here where there are budget buyers and top tier buyers. In the end, it’s a bit harder for the average person to wrap their mind around the middle tier- you can’t really brag at how super cheap it is nor can you flash what is unattainable to most. Fair enough. I would say that some of those higher end teas though are quite scarce. There may be twice as many people buying the mid-tier teas, but the supply in the west may be five or six times as high. We’ve all heard of that super exclusive “two tong production”. Hard to say for certainty because most folks keep their buying private. I agree on Qizhong and some of YQH in general. Even with the increased price, the tea remains a pretty good value still.